PUT him in the spotlight, and Anthony Callea hits some pretty mean notes. Plant the right foot and the talented Australian singer-songwriter also appreciates a nice soundtrack from the exhaust. Ahead of his latest tour, we caught up with him to discuss his motoring life. My first ever car was a gold coloured, 190E Mercedes that I bought off my Nonno. It definitely wasn't new but my Nonno being my Nonno, it was in amazing condition. It had cream leather seats, a sunroof and 18-inch alloys. Okay, I'm sounding like a real wog boy right now! I'm not going to lie, I love cars and made sure I had it in the driveway a month before I turned 18, basically just so I could look at it and wash it every second day. I booked in my driving test at 9am on my birthday and by 10.30am I was in my car with my P-plates on the road. I eventually traded it in for another car but I think with anyone's first car, it always brings back exciting and fond memories. I drive a Jeep Grand Cherokee (Overland). This car is fitted out with all the gadgets and features anyone could need or ask for… I love the air-conditioned ventilated seats, the heated steering wheel, the panoramic sunroof and most importantly, well to me anyway, a cranking sound system. I've never had a diesel car before, but now driving a diesel I don't think I can ever go back. It may have some great luxury features but most importantly, it drives really well and I do feel like the king of the road in it. Growing up, our family car was a light blue Ford Fairlane. I do remember that on my brother's side of the car, the door lock was a bit dodgy so my mum used to always say when we got out "make sure that door is locked". Oh and who can forget the light blue sheepskin seat covers….what was my dad thinking? Drivers that don't know how to merge. It's not that hard. This constantly changes. One of the features of the Grand Cherokee is that I can load up the hard drive with all my music in different playlists or just Bluetooth it. However, today I was listening to a bit of Matt Cusson. Joan Rivers… could you imagine? This constantly changes actually. So I suppose the question should say "cars"! I one day would like a garage full of cars, maybe five or six… that's not too excessive is it? 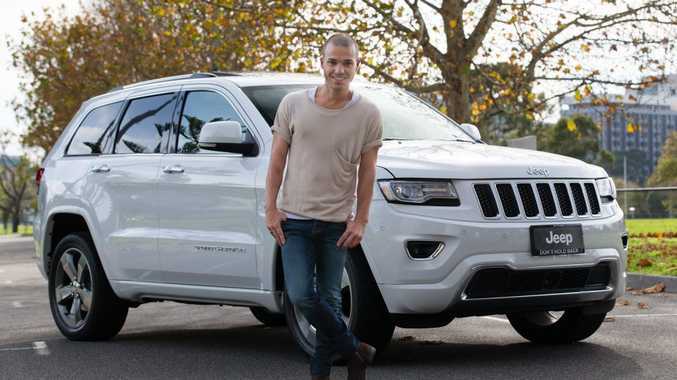 Anthony Callea is a Jeep ambassador. Resume: The Australian singer-songwriter shot to fame when he was runner-up in Australian Idol 2004. He has gone on to become an Aria award winner and his debut single The Prayer was Australia's highest selling single of all time. See him: Perform Ladies & Gentlemen, The Songs of George Michael, at the Brisbane Exhibition and Convention Centre, September 27. Tickets through Ticketek.